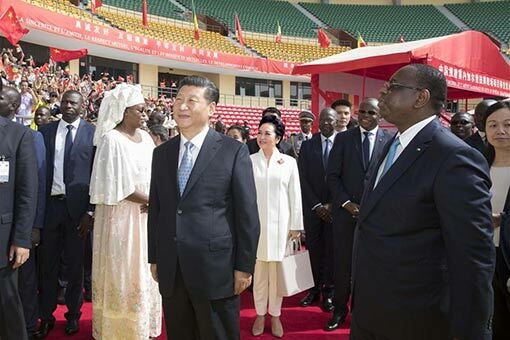 Xi Jinping’s choice of Senegal for a state visit on 20–21 July, his first visit to West Africa, en route to the BRICS summit in South Africa, suggests that China seeks to deepen cooperation in a region that has seen comparatively less Chinese engagements than elsewhere in Africa. In using Senegal as a springboard, China seeks to advance strategic goals: bringing West Africa into the “Belt and Road” orbit and consolidating influence in a historically French-dominated region. In addition to having significant infrastructure plans for Senegal, including a trans-African highway running from Dakar to Djibouti, China recently concluded a range of deals in other West African countries: the Dakar-Bamako rail line under rehabilitation formed part of a larger set of deals signed between Mali and China, including an $8 billion railway link between landlocked Mali and the Guinean port of Conakry; and China is also building major dams in Guinea and Ivory Coast, the latter of which recently received a $7.5 billion Chinese commitment to invest in infrastructure. As China’s regional footprint grows, France’s is arguably waning. This is exhibited by debates over the continued use of the West African Franc (CFA) as the currency for Francophone countries, the loss of business contracts to Chinese companies, and France’s recent overtures to Anglophone countries such as Ghana. Meanwhile, in May Burkina Faso switched recognition from Taiwan to China. It is the last francophone African country to do so, and the second-to-last African country. Were China to succeed in rivalling France for influence in francophone West Africa, the breadth and depth of its economic and political engagements in Africa will truly be unmatched. But why Senegal? China chose Senegal for four key reasons. First, China seeks to solidify its relationship with a historically unsteady partner. After independence in 1960, Senegal recognised Taiwan over China, before switching course in 1971. In 1995 it re-established relations with Taiwan. This lasted until 2005, when it reverted back to China. Since then, according to the Chinese Ministry of Commerce, the total volume of China–Senegal trade increased from $196.7 million in 2005 to $2.3 billion in 2015, when China became Senegal’s second largest trading partner, second only to the European Union (where the relationship is dominated by trade with France). China’s top imports from Senegal include raw materials, such as ground nuts and their by-products, and titanium ore, while Senegal’s primary imports from China include technology and infrastructure-related products. China initially began investing in Senegal’s agricultural sector, but its economic engagements have diversified into telecommunications, agriculture, energy, and transport infrastructure. Second, Senegal is economically and politically stable. At 7.2%, the country is tracking the second-highest economic growth rate in West Africa, behind Ivory Coast, according to the International Monetary Fund. In contrast to the Ivory Coast, Senegal has no history of acute political upheavals and is considered a model of good governance in Africa. Moreover, Senegal is actively looking beyond traditional partners to attract investment for President Macky Sall’s Plan Sénégal Emergent, the country’s plan to attain middle-income status by 2035. If these positive trends continue and Senegal manages its newfound oil and gas reserves in a developmental way, the region’s economic prosperity – and the role that China can play in it – will depend significantly on developments in Senegal. Third, China views Senegal as a gateway to the West African region. In June, Chinese Foreign Minister Wang Yi stressed that China regards Senegal as an important cooperation partner and is ready to build the bilateral relationship into a “model of friendly relations between China and West African countries”. Senegal is strategically located at the intersection of Saharan and sub-Saharan Africa, and the Port of Dakar is the one of the largest and most efficient deepwater seaports along the West African coast. Dakar’s new airport, opened in December 2017, rivals that of Abidjan and will become a regional transport hub. Fourth, the development of a Chinese-funded special economic zone (SEZ) outside of Dakar suggests Chinese ambitions beyond the region. This is the first Chinese-built SEZ to be established in either West Africa or francophone Africa, and will be the first instance of Chinese industry spreading to francophone West Africa. Since Senegal is a member of the African Growth and Opportunity Act (AGOA), China will also be able to export goods manufactured in the SEZ to relatively close markets in the US and Europe through Senegal. In so many ways, Senegal is an ideal partner as China seeks to expand its political and economic reach in Africa. For Senegal, it is an opportunity to direct China’s engagements into those sectors where it has a comparative advantage, and that will help the country realize its ambitious economic development plan.